Bill "Mad Dog" Madlock, Jr. (born January 2, 1951) is a former Major League Baseball player. 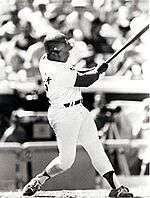 From 1973 to 1987, Madlock was a right-handed hitter who won four National League batting titles. His record of four batting titles as a third baseman would be eclipsed in 1988 by Wade Boggs. Since 1970, only Tony Gwynn has won more National League batting titles (eight). Madlock is also one of only three right-handed hitters to have won multiple National League batting titles since 1960, Roberto Clemente having also won four and Tommy Davis having won back-to-back titles in 1962 and 1963. Bill Madlock was born in Memphis, Tennessee, but grew up in Decatur, Illinois, where he graduated from Eisenhower High School. His future wife Cynthia attended the same city's Stephen Decatur High School. At Eisenhower High he played basketball, football and baseball. He received 150 scholarship offers for his skills as a basketball player, around 100 for his skills as a football player  and two for his skills as a baseball player. He accepted one of the two baseball scholarships, at Southwestern Iowa Community College in Keokuk, Iowa, because of his preference for playing a less hazardous game. His reasoning was clear from what he later told a Sports Illustrated reporter: "I didn't want to have 6'5", 250-pound guys bearing down on me, so I decided to play baseball." He was considered for the baseball draft by the St. Louis Cardinals in 1969, but would not sign with the Cardinals for two reasons. The first was because he figured he would have a difficult time breaking into the majors as a shortstop given the abilities of the Cardinal shortstop at the time, Dal Maxvill. The second was the delay required by the birth of his daughter Sara in December 1969. By the time Madlock was ready to sign with a major league baseball team, he had decided to go with an offer from the Washington Senators organization. While an active player with the Pittsburgh Pirates in 1983, Madlock's three children, his daughter Sara and his older sons Stephen and Douglas, had earned the nickname "The Mad Puppies" around the Pirates clubhouse. Madlock's fourth child, his son Jeremy, was born in what was described as a "tense delivery" by Madlock, who witnessed it in the delivery room, in that same year. In a 15-season career, Madlock, nicknamed "Mad Dog", compiled a .305 batting average with 2008 hits, 163 home runs and 860 runs batted in. Madlock was drafted by the Washington Senators in the 5th round of the secondary phase of the 1970 amateur draft. He made his debut with the Texas Rangers (who had moved from Washington after the 1971 season) on September 7, 1973, and played 21 games with them, batting .351. After the season, Madlock and Vic Harris were traded to the Cubs for Ferguson Jenkins. Madlock replaced Ron Santo as the Cubs' third baseman and hit .313, the highest average for a Cubs third baseman since Stan Hack batted .323 in 1945. In 1975 Madlock won his first batting title with a .354 average. On July 26 of that year he went 6-for-6 during a Cubs' loss to the New York Mets. He also made the first of his three All-Star appearances and shared Game MVP honors with Jon Matlack. In 1976 Madlock repeated as batting champion with a .339 average, edging out Ken Griffey, Sr. of the Cincinnati Reds on the final day of the regular season (October 3, 1976). In an 8–2 win over the Montreal Expos, Madlock collected four singles to raise his average from .333 to .339, one point ahead of Griffey. Griffey belatedly entered his team's game (which the Reds won 11-1 over the Atlanta Braves), and went 0-for-2, dropping his average to .336. After the 1976 season, Madlock was traded to San Francisco in a deal that sent Bobby Murcer and Steve Ontiveros to the Cubs. Madlock, an average fielder at best, was moved to second base (the Giants already had Darrell Evans at third), and batted "only" .302 and .309 in 1977 and 1978 respectively. In June 1979, the unhappy Madlock was traded to Pittsburgh and won a championship with a Pirates team with stars Dave Parker and Willie Stargell. Madlock returned to third base and batted .328 with the Pirates during the regular season and .375 in the World Series. In 1980 Madlock's average dropped to .277 as the Pirates finished third in the National League East, eight games behind the eventual World Champion Philadelphia Phillies. For Madlock, the season became infamous for an incident during a May 1 game against the Montreal Expos at Three Rivers Stadium. Madlock poked umpire Jerry Crawford in the face with his glove after being called out on strikes with the bases loaded. National League President Chub Feeney fined Madlock $5,000 and suspended him 15 games. Madlock appealed the suspension and remained in uniform before finally serving the suspension on June 6, after National League umpires threatened to eject him from every game he tried to play in. Madlock won two more batting titles, in 1981 and 1983, making him the first player to win multiple batting titles with two different teams. He also finished second in the National League in batting in 1982, his .319 average bettered only by Al Oliver's .331. Afterwards, however, his play mirrored the decline of the team. In August 1985 the Pirates traded him to Los Angeles which, like Pittsburgh in 1979, was contending for a division title. The Dodgers lost to the St. Louis Cardinals in the NLCS but Madlock hit three home runs in the loss. In 1987 the Dodgers traded Madlock to Detroit, where he again earned a trip to the postseason. Madlock became a free agent at the end of the 1987 season and played for the Lotte Orions in Japan in 1988. Madlock is the only major league baseball player to have won four batting titles who is not enshrined in the Hall of Fame. August 16, 1975: In the first inning of a game against the Houston Astros at the Astrodome, Madlock was ejected for arguing with umpire Art Williams on a close play at first base in which Madlock was called out. He was ejected by not only Williams but also home plate umpire Bruce Froemming, who overheard Madlock's angry profanity-laden tirade. May 1, 1976: Madlock was fined $500 for charging the mound after San Francisco pitcher Jim Barr brushed him back with a pitch during a game at Candlestick Park. Spring training, 1978: Madlock, as a Giant, got into a clubhouse fight with John Montefusco after interrupting an interview with the pitcher. Afterwards, Madlock ripped Montefusco: "I've heard and read where Montefusco has said this team is a team of losers." As a player, Madlock was ejected from 18 games. He was also ejected from three games during his two years as a Tiger coach. Over time, Madlock's approach to umpires changed. Umpire Jerry Crawford remarked after his 1980 dispute with Madlock that "[t]here's no question [Madlock has] calmed down. He's changed, which is great, because a guy of his ability doesn't have to do the things to umpires that he was doing." Madlock's agent, Steve Greenberg, son of baseball great Hank Greenberg, added that "[t]he Crawford incident was a benchmark. Now if he disagrees with an umpire, he uses his charm, which can be considerable." In 2000 and 2001 Madlock was a coach with the Detroit Tigers, reuniting with Tigers manager and former Pirates teammate Phil Garner. In 2001, Madlock was invited by Omar Moreno, another former Pirate teammate, to coach in a professional league in Panama City, Panama. In 2003, Madlock was hired to manage the Newark Bears of the independent Atlantic League; the team went 117–134 during his two seasons. In 2013, he was announced as the manager of the Independent League Tiffin Saints. ↑ "Bill Madlock". www.thebaseballpage.com/players/madlobi01/bio. Retrieved 2 January 2016. 1 2 3 4 5 6 "Glad Times For Mad Dog". www.si.com/vault/1983/05/09/619637/glad-times-for-mad-dog. Retrieved 2 January 2016. 1 2 "Tales from the Cubs Dugout". Retrieved 2 January 2016. ↑ "Charlton's Baseball Chronology". www.baseballlibrary.com. Archived from the original on 28 July 2013. Retrieved 4 April 2013.